Several years ago, Intel showed off Edison, a prototype of an entire low-powered computer contained inside of a postage stamp-sized SD card. Google has now made an even smaller computer — sort of. 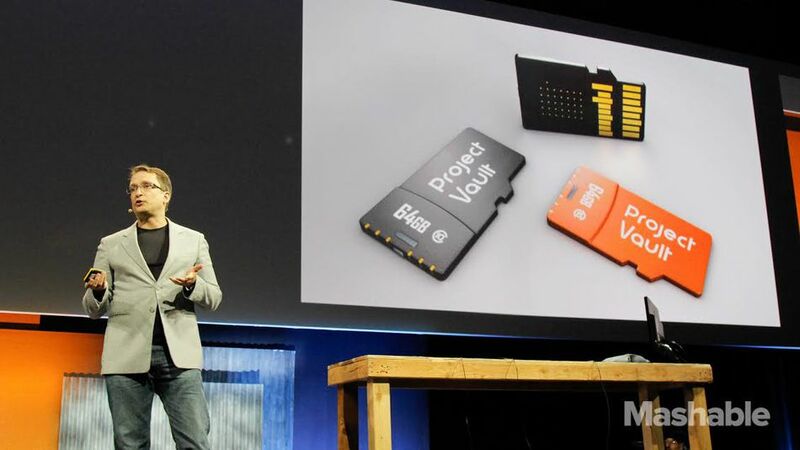 On the second day of its annual Google I/O developers conference on Friday, Google unveiled Project Vault, a secure computer that fits into a microSD card slot (yes, those little memory cards you put in your phone to expand the storage). Designed by Google’s ATAP (Advanced Technology and Projects) group, Project Vault is technically a computer, but it’s not for regular computing. It’s a new way to communicate securely and authenticate without entering passwords. Project Vault has an ARM-based processor (the same kind you’d find in most smartphones and tablets), NFC and an antenna. It’s also got 4GB of “isolated, sealed” internal storage. The teeny tiny computer runs a custom Real Time Operating System (RTOS). In one demo, Google showed how two users can chat with each other using their Vault-equipped smartphones. Because the chats are encrypted and sent through Vault’s encrypted channel, the chat data is never sent through the phone; carriers can’t snoop on you. Because the chats are encrypted and sent through Vault’s encrypted channel, the chat data is never sent through the phone; carriers can’t snoop on you. Edward Snowden would be proud of Vault, for sure.Google says you’ll also be able to encrypt video with Vault. With Project Vault, instead of entering easily crackable password strings, Vault can tap into new security models like the ability to authenticate users based on things like typing patterns and activity usage. ATAP calls this a “trust score” and says that it’s up to 10 times more secure than simply typing in a password. For example, if you use Chrome and YouTube a lot throughout a day, but then another user takes your Vault-equipped phone and their usage pattern doesn’t match yours, the device will know something fishy is going on, and that it’s likely not you using it. Interested developers can find ATAP’s open source development kit for Vault on github here. Can You Download Knowledge Into Your Brain With Electricity? How Would You Choose the Best Excavator Rental Company?